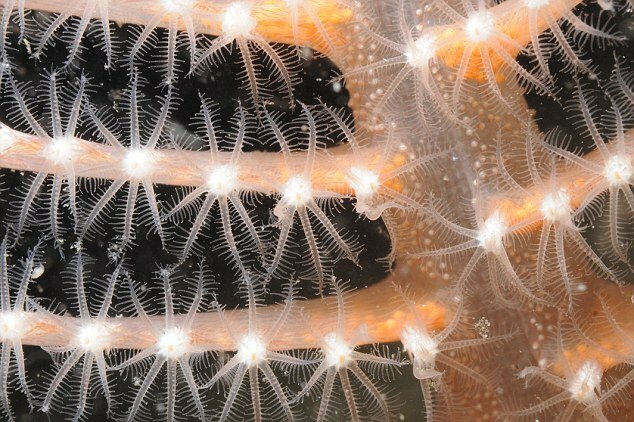 A sea creature that lights up when touched – was one of several rare and elusive species captured by Scottish marine surveys this year. The phosphorescent sea creature or “sea pen” – so called because it looks like a writer’s quill – is a colony of polyps that anchors itself to the sea bed in the North Sea. Other finds included the “prehistoric faceless and brainless fish” Amphioxus – a modern representative of the first animals that evolved a backbone half a billion years ago. The elusive, rarely seen Amphioxus was found in the waters off Tankerness in Orkney by marine surveyors this year. Instead of a brain – or face – the fish has a nerve cord running down its back. One species of Amphioxus recently had its genome sequenced in an attempt to understand the origins of vertebrate life. Vertebrate life and amphioxus are thought to have descended from a single common ancestor around 550 million years ago. The species was unearthed in series of 15 marine surveys in 2011, covering over 2,000 square miles using acoustic multi-beam scanners and hi-def cameras. Dozens of rare, strange species were found in Scottish waters. The largest Horse Mussel bed in Scotland was revealed in waters near Noss Head, Caithness. Known as “Clabbydhhu” in Gaelic (translates as “enormous black mouth”) these slow-growing mollusks can live to nearly 50 years old. Off the west coast, very rare Fan Mussels were found – at up to 48 cm long, this is Scotland’s largest sea shell. Around the Small Isles more than 100 specimens were discovered, the largest aggregation in UK waters. With golden threads likened to human hair so fine they can attach to a single grain of sand, seamen once believed they fed on drowned sailors. Other finds included Flame Shell beds in Loch Linnhe, Argyll, a cryptic species only found in a very few west coast locations with bright orange feeding tentacles. The survey this year benefited from the use of the latest technology, with acoustic multi-beam scanners used to create 3D images of the seabed. As a result, first-ever marine maps of many new areas was possible, including waters around Rockall, to the west of the Outer Hebrides, around the Isle of Canna and within Sinclair Bay in Caithness.